Yesterday Elisa & Lindsay from our Chicago team wrapped up our time at the Chicago Flower & Garden Show! It ran from March 12-20th at the Navy Pier. It was such a blast! It was a jam-packed week of festivities and we loved it! This was our first time participating in the show and it did not disappoint! The nine-day event featured 20+ walkable life-sized gardens, daily seminars, DIY workshops and a bustling marketplace. "The roots of the Chicago Flower & Garden Show can be traced back as far as 1847. When it first began, the show was a flower and fruit exposition presented by the Chicago Horticulture Society (CHS). Similar to today, the events were organized by like-minded gardeners who were looking for a way to trade horticulture tips and techniques among exhibitors and participants." Atmosphere Event Group is one of our go-to wedding and event vendors for too many reasons to name, but one of the HUGE ones is that they are simply incredible at what they do! They are SO creative and use the best quality products. They're super professional, but fun too! They don't think we're crazy when you ask for the seemingly impossible, because they can make it happen. We wanted something really fun and vibrant, something that felt like a backyard party among friends ( friends that share our love for botanicals, of course). Chicago in the Spring is fantastic, and we felt like this entire set-up represented our love for this fabulous city. The trivia cards were a fun touch and the vintage table setting added just the character we wanted. Oh, and tell us that the cakes- both the edible and non-edible aren't just awesome? And the chandalier? Yeah, our jaw dropped a little too! 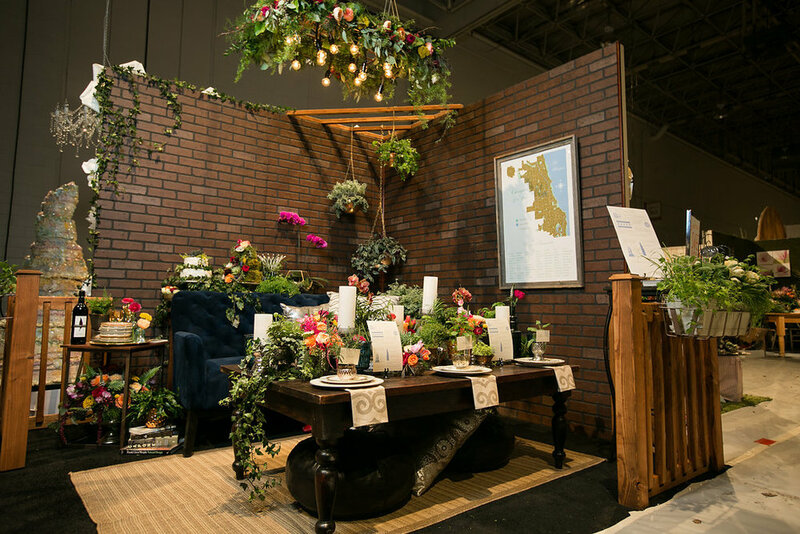 Check out the official Chicago Flower & Garden Show site, as well as our personal team page!